“Eliminating food waste” was the theme of the inaugural Zero Waste Food Conference, hosted by The New School and the Institute of Culinary Education. The purpose of the two-day event, held on April 28th & 29th 2017, was to “discover better methods for the way we produce, distribute, consume and dispose of food in the environments where we cook and where we eat.” Panel discussions covered topics such as sustainable kitchen design, uncovering fresh connections in the food chain, and repurposing kitchen “scraps” into delicious, sustainable meals. Cooking demonstrations addressed food innovations such as beer made from surplus bread, butchery that wastes not, and the art of preservation through fermentation lead by pickling experts. The schedule was jam-packed with illuminating discussions and wow-factor cooking demos, we can’t wait to see what they come up with next year! As a Zero Waste event, it was important that the conference produce as little landfill waste as possible. Common Ground Compost was thrilled to provide waste management services throughout both days to help achieve that goal. In preparation for the event, our staff assessed the various event spaces and designated optimal waste station placement. We communicated with the building staff to ensure they understood the plan for the conference, which included stationing volunteers at each waste station, to be sure that waste separation tips could easily be communicated to event attendees. Supervision at waste stations can be one of the most effective tools to reduce contamination in the recycling streams, and as was the case at the Zero Waste Food conference, the volunteers provided the added bonus of educating participants in responsible waste management in NYC. CGC provided waste stations and color-coded signage where needed, and had representatives present to prevent contamination and track the various waste streams. At the end of the day at each venue, we weighed every bag of waste and categorized it as either compost, recycling, mixed paper, or trash. 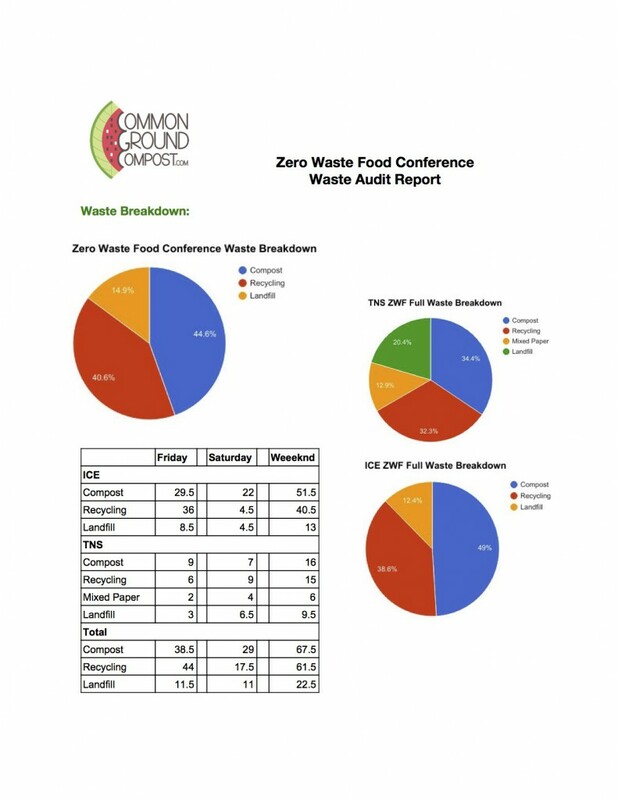 Take a look at the waste characterization from the event, especially the high proportion of compostable waste! We had such a blast contributing our services to this conference. We had great discussions with many curious participants about responsible recycling practices and even learned a thing or two about sustainable cooking! If you are hosting an event of any kind and need waste management help, please reach out. We can’t wait to hear from you!